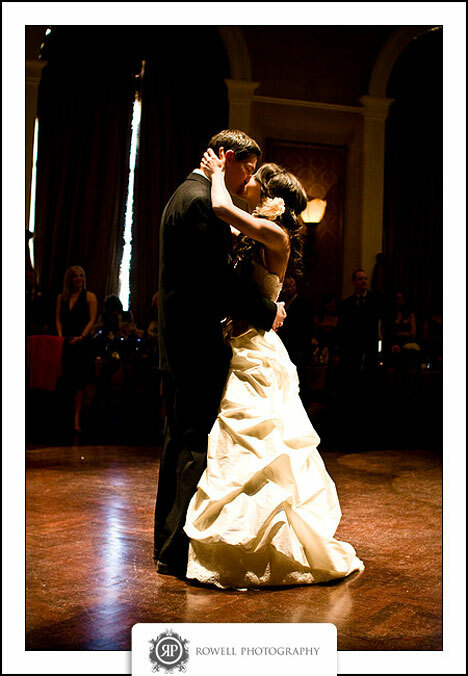 Dena and Michael met in 2004 aboard a cruise ship and fell in love. He was an officer, she a performer. Surrounded by close friends made on the ship, they began a journey together that was envied by all. 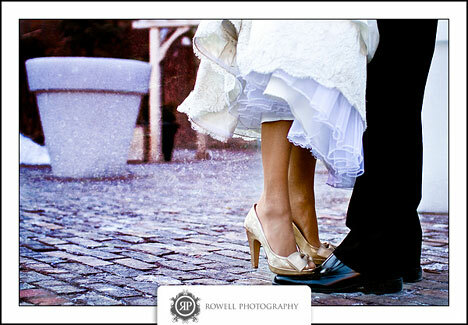 When they began planning their wedding day they knew they wanted to include a lot of personal history. They decided to use the Liberty Grand because of the history and the antique feel that it commanded. 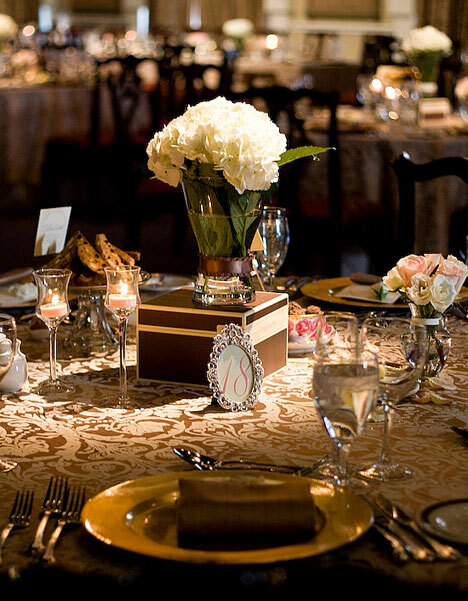 Dena wanted to make her day as unique and as personal as possible, so she decided to do most of the décor herself. She made all the centerpieces, using her Grandmother's teacups, and frames. She made all the menus, coat check tags, favour boxes and much more. Each detail was true to the theme and had a personal element. 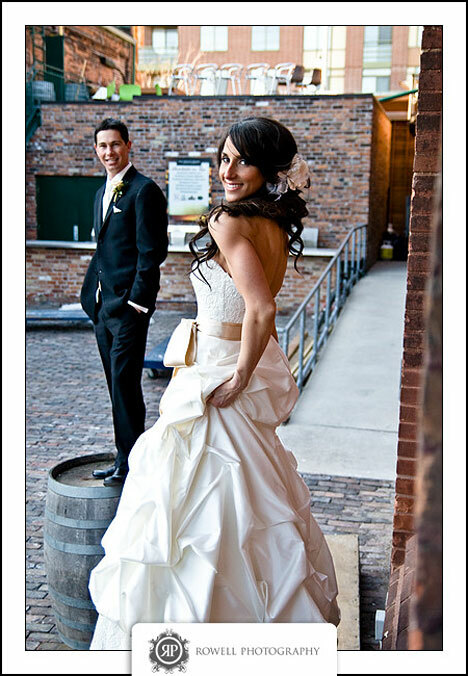 The ceremony took place at Dena's church, Parish of the Good Sheppard and photos were taken in the Distillery District by Rowell Photography. Dena wanted to have something for her guests to do and look at, so she displayed her wedding cake, made by Sweet Finale Cakes and her candy buffet in the lobby. 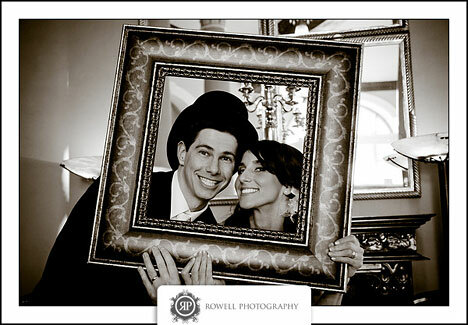 She also had an antique photo booth set up, where guests could dress up and have their picture taken. There was also a love book, aptly made by Dena, chronicling their relationship to date. 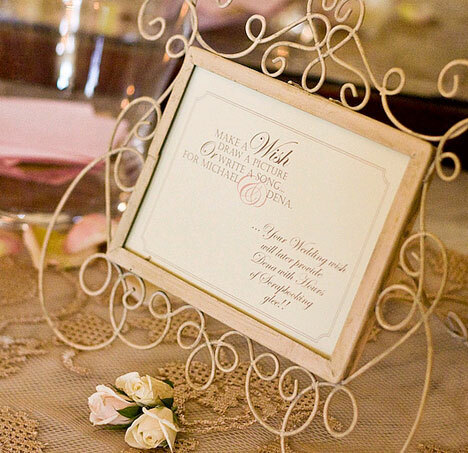 The guests could also leave a wish card, replacing the traditional guest book. Upon entering the main dining hall there were audible gasps, it was stunning, lighting from Event Services Group helped to make each table stand out. 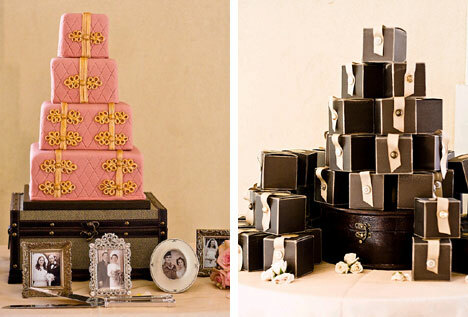 The colour scheme was pinks, white, gold and chocolate brown. 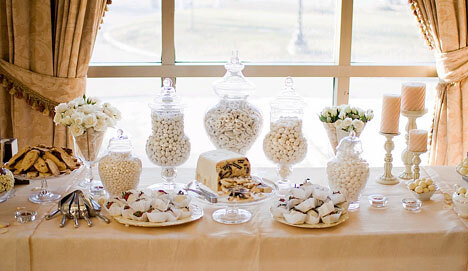 Each table had a multileveled centerpiece, consisting of a large vase on an antique box with white Hydrangea, a small vase with white and pink roses, an antique frame with the table number, as well as an antique tray with homemade biscotti and one of Dena's Grandmother's teacups filled with homemade truffles. 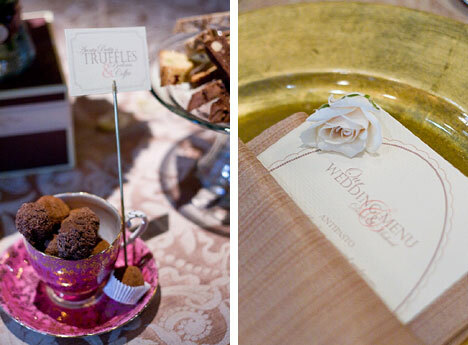 Each table also had a menu card and a single rose on each gold charger plate. 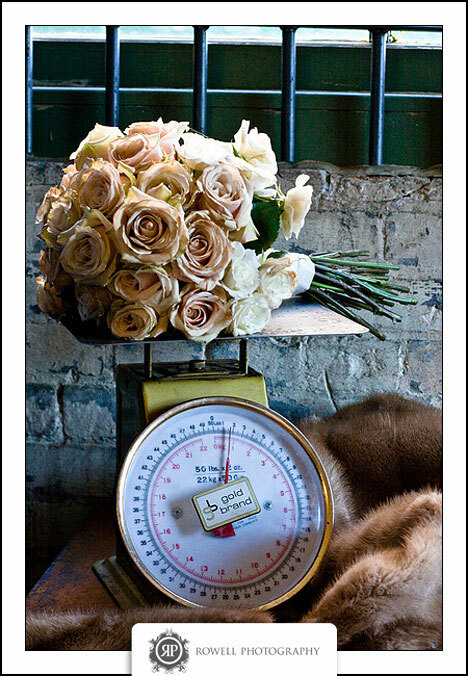 The beautiful flowers were by Toronto florists La Pegas. 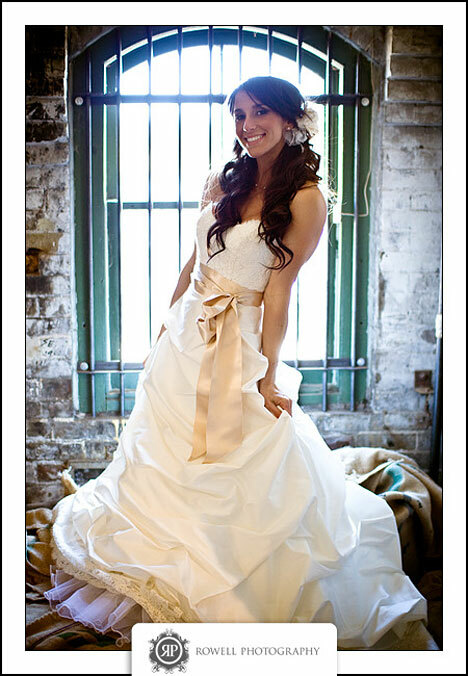 Cherish Event Management made sure that Dena's hard work was fully realized and the day was perfect for Dena and Michael. 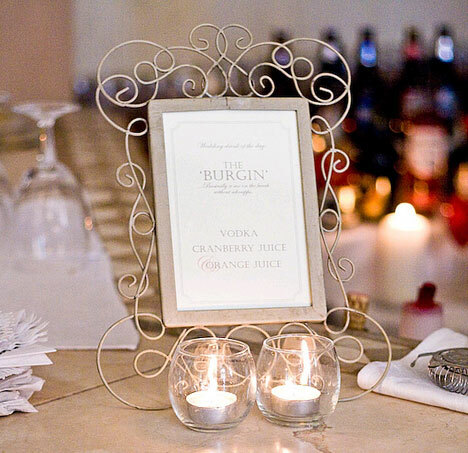 The highlights of the evening were the antique inspired photo booth, where guests enjoyed dressing up and getting their photos taken; the hour of only candlelight, to participate in Earth Hour, which added just one more element of romance and history; a special surprise song performed by Dena; and a beautiful white candy buffet! Most importantly though, true to Canadian history, the special day was about a family welcoming, with open arms and a lot of love an immigrant from South Africa into their purely Canadian family.